I’m sure you’ll agree that a tea kettle must be well made, hold the right amount of water, and heat quickly. That was our top criteria for selecting the best tea kettle. If you want to sit back with a warm cuppa while you read the details, the OXO Good Grips Classic Tea Kettle, is a combination of all these features and was selected the “Best Overall” pick from our editorial team. Tea is a favorite beverage for many people across the globe and having a great tea kettle can make drinking your tea even more enjoyable. In fact, some people love tea kettles so much that they even have a tea kettle collection. We reviewed the top-rated tea kettles for you, listed the best features of each and determined what makes them top rated. With this information you will be able to easily sort through the many styles available to find the perfect tea kettle and get on with enjoying your tea! Also, be sure to look at our buyer’s guide below that will give you heaps of additional information on tea kettles so you can know what to look for when starting your research. Hot tea has been around for centuries as a favored beverage. Nowadays it is enjoyed by many as a way to unwind after a long day and is also a great drink for someone who isn’t feeling well. It is even a major part of European tradition as they enjoy their daily, afternoon tea time. Continue reading below to learn about some great tea kettles and see which styles appeal to you. You will love tea time when you use this traditional, whistling tea kettle by OXO. It has silicone touch points in crucial areas such as the spout cap and handle that resist heat and prevent burns. When you’re heating up the water, flip the spout cap down and you’ll know the water is ready when the whistle blows. This brings back nostalgic memories for many as they think of their mother or grandmother making tea when they were little. Once the water is ready, flip the spout cap back so the precision spout won’t drip while you pour water into your tea cups. The handle conveniently folds down and out of the way when you are filling the tea kettle with water or when it is being stored. The large opening makes filling it very easy simple and cleaning it is a breeze too. The OXO Good Grips Classic Tea Kettle is made from seamless, high-grade stainless steel that protects the kettle against rust. The whistle is loud and clear and easy to hear even if you are in another part of the house when it goes off. If you don’t want the kettle to whistle, just leave the spout cap up and it will not make a sound. This tea kettle cannot be used on induction stoves. The next time you want a nice cup of hot tea, why not heat up your water in this beautiful and stylish Chef’s Secret 2.75qt tea kettle that sports a copper, capsule bottom and is made from surgical stainless steel. The mirror finish looks great with any kitchen décor or color scheme and the black riveted handle adds some contrast to the steel kettle. When your water is ready, a whistle will sound and alert you that it’s time for tea. 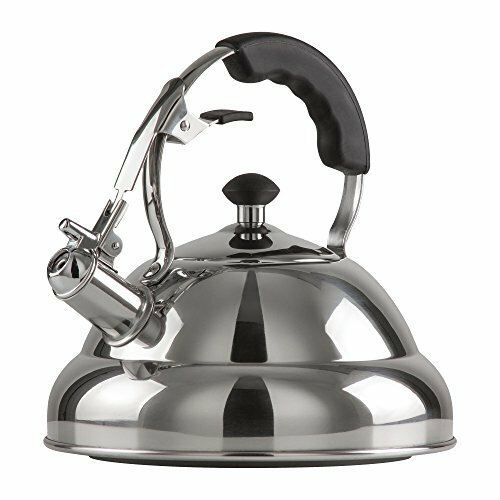 This great tea kettle comes with a limited lifetime warranty and can be used on an induction cooktop, unlike the OXO brand which can’t. The whistle is not shrill and annoying; it starts softer then builds to a loud whistle the longer it is left on the stove top. Now you know it’s time to take it off the burner and have some tea! This tea kettle not only looks great but is completely functional with a 6-cup capacity, narrow spout and goose neck curve that allows users to slowly pour the water into the cups for a great tasting cup of tea or coffee. This great tea kettle can be used on electric, induction and gas stoves and can even be washed in the dishwasher for thorough and easy cleaning. The angled handle stays away from the hot kettle pot and prevents you from burning your hands. It is made of stainless steel with a beautiful mirror finish that looks fantastic in any kitchen. The cute design also fits in well to being a part of a tea kettle collection with the little black knob on the lid and the small handle. This particular model does not whistle when the water is ready so be sure to keep an eye on it so it doesn’t boil dry. Having tea can make you feel calm and relaxed and the classic, whistling tea kettles are like stepping back in time to when you were a kid. Best of all, you don’t have to go back in time to enjoy the classic styling and great performance of these top-rated tea kettles. The top-rated tea kettles reviewed here are customer favorites for many reasons including their stylish looks, a whistle that doesn’t sound shrill, and sizes that are perfect for 1, 2 or more people. Below is a buyer’s guide that will give you some great information on tea kettles including what to look for when you start researching to determine which appeals to you the most. We’ll go over features, materials and more so you will have all the knowledge you need to make a great choice that you will enjoy, every time you have a cup. What is a Tea Kettle? The history of tea kettles is quite interesting. Travelers and soldiers in ancient China would boil water to remove impurities that would make them sick. They would add green tea leaves to the boiling water so it would have some flavor which led to the creation of tea. Green tea is now a wildly popular and very healthy drink. Additionally, over time, tea kettles were often used by cowboys to boil water for their coffee during cattle runs. These kettles were heated in or over campfires so they needed to be very durable and made from a material that wouldn’t burn. For this reason, many of the tea kettles that cowboys used were made of copper which is a perfect heat conductor. In Japan, there is a specific way to serve tea that is a highly-regarded cultural activity. It is a choreographed ritual with a lot of meaning. All in all, tea kettles are part of something that has a lot of history and a lot of meaning all over the world, not just in our own backyard. There are two basic types of tea kettles that you can purchase: stove top and electric. There are benefits and drawbacks to each and one type may work better for your lifestyle and home. We’ve outlined the differences below. Electric Tea Kettles – Electric tea kettles have their own heat source so if you don’t have a stove top or burner this is a great option as you’ll still be able to make a great cup of tea. Electric tea kettles heat water very quickly, sometimes in less than a minute depending on the model of kettle. Some models of electric tea kettles have even included the whistling sound which alerts you that the water is heated. Other types have an automatic turn off to keep the kettle from boiling dry. Electric tea kettles have many styles and some can even turn cordless wherein the kettle can be moved outdoors once the water is heated. For example, for enjoying a few cups of tea on the deck without having to bring the power source. Stove Top Tea Kettles – Stove top tea kettles are often made of stainless steel and other materials such as copper which are good heat conductors. This type of tea kettle requires a stove top or burner of some kind to heat the water. Durable kettles made of copper can even be used over a campfire. One of the enjoyable features of most stove top tea kettles is that they will emit a whistle when the water is done boiling. The whistle usually starts off low then gets louder the longer it boils. This is so users don’t ignore it and let the kettle run dry. If you prefer, some models have an option to keep the spout up which eliminates the whistle from sounding. There are many different styles and types of stove top tea kettles which is one reason they’ve become so collectible. It might sound like an odd question, but where you will be making tea and using your tea kettle can determine which type is best for you. At Home – If you’re going to be making tea at home, you can choose either a stove top tea kettle or an electric model. Many people don’t have much counter space which makes a stove top model perfect. You can even find both stove top designs and electric designs to match your existing kitchen décor. At the Office – Office kitchens are often not equipped with stoves. So, for this reason, an electric tea kettle would be the best choice for making tea a regular thing at work. Dorm Rooms – If you don’t have access to a stove or burners, you will want to get an electric tea kettle. An example of this would be dorm rooms that aren’t near a kitchen or heat source as these are required for a stove top model. On the Road – If you are camping or traveling you can still have tea. If you’re enjoying old-fashioned outdoor camping, find a great stove-top kettle to heat on the grill. Or, if it’s made of the right materials, you can just place it over the fire. If you’re traveling in an RV and have a stove top you can still use a stove top kettle. If you don’t have access to a burner or stove in the RV then an electric tea kettle will work nicely. Tea kettles are made of many different types of materials. This makes them a very popular collectors item for the many people who love the different styles, materials and shapes they come in. Below we’ve outlined some of the more common materials that are used to make tea kettles. 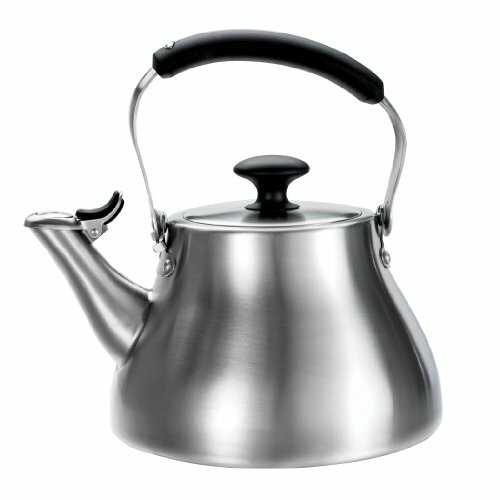 Aluminum – Aluminum tea kettles are a great choice for campers due to their light weight. They are made from anodized aluminum and are quite energy efficient. They can be a little expensive but they are stain and scratch resistant so they usually last a long time. There have been some questions raised on the long term safety of aluminum as a cooking material. If you have 1-2 cups of tea every day you may want to opt for a different material for your tea kettle until more research is published. 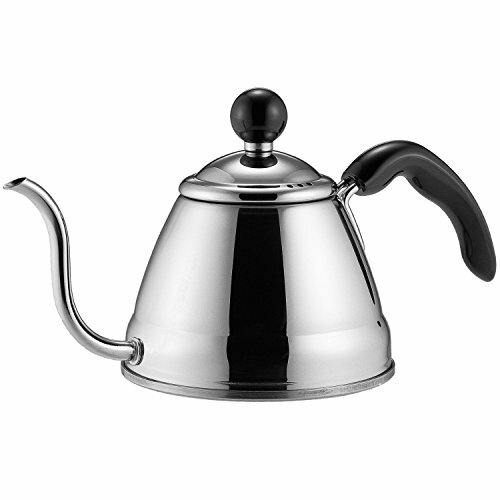 Stainless Steel – One of the most popular materials for tea kettles to be made of is stainless steel. This material takes awhile to heat up yet is generally very easy to keep clean. Also, stainless steel tea kettles are usually inexpensive. If there is not a rubber grip on a stainless steel handle it can get very hot, so using a pot holder will be necesssary. Glass – Glass tea kettles are very easy to clean and they look pretty too. If you want to serve tea to guests, a glass tea kettle will give your tea a visual appeal as well as being functional. Glass tea kettles need to be heated more slowly than other types of materials. Instead of sitting the glass tea kettle directly on the burner, you should put a metal trivet down and then set the tea kettle on top of that. They can also break during washing and moving. While they are very pretty to look at, more care is involved in keeping them in one piece. Copper – Copper is the best heat conductor and is what cowboys used most often on cattle runs. Never heat a copper tea kettle on high heat. Medium is plenty high enough and even on medium they will heat water very quickly which means they use less energy than other types of tea kettles. Copper kettles do involve more maintenance to keep them from tarnishing and it’s a softer material too. They need special cleaning solutions to prevent the pretty copper finish from being scratched. Cast Iron – Cast iron tea kettles are heavy and durable. They are also excellent for holding heat and look fantastic too. The drawback to cast iron is that without proper care they can rust. Some cast iron tea kettles have enamel coated insides and you will need to clean carefully to avoid scratching the enamel. Drying your tea kettle between each use is very important. By taking care of it properly, a layer of minerals will build up that will make the tea kettle virtually rust proof. Even though they take longer to heat up, once they are hot they will stay hot for a long time. Cast iron tea kettles might have a plain iron finish yet other times they have enamel coatings in different colors. The coating can chip if handled roughly. It doesn’t matter if you are an avid tea drinker or if you just like to drink it occasionally, having a great tea kettle can bring enjoyment to your life if you are one who likes to make hot drinks like cider, hot chocolate and hot tea. With features like whistling, cool-grip handles and tons of styles and shapes, you’ll find a lot of choices to find that perfect one. The information in this buyer’s guide can arm you with the wisdom you’ll need to choose the right kettle that will fit your preferences and needs. It will be easy to make a great choice once you identify exactly what you need. Once you find a tea kettle that boils water at a good rate of speed, that has a comfortable and easy-to-use handle, that is durable and cleans easily then you will always have a great cup of tea that you’ll enjoy making. Best Lawn Tractor We like the Husqvarna tractors the best when you take price, reliability, maneuverability and the number of available attachments into consideration….